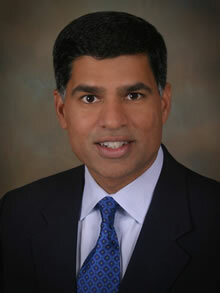 SAN DIEGO – Viraj Master, MD, PhD, FACS, Winship Cancer Institute member and director of clinical research in the Emory Department of Urology, took first place for his presentation at the Research Forum at the American Urological Association (AUA) Annual Meeting in San Diego, May 4-8, 2013. Master was one of nine presenters in the "Showcase for Early Career Investigators" program, the only event that provides an opportunity to spotlight early career investigators, defined as PhD and MD researchers within eight years of completing a postdoctoral or training fellowship. Master received the Best Presentation award for his talk on an investigation into the level of health literacy demonstrated in the relationship between prostate cancer patients and their doctors. That initial study, which involved Grady Hospital patients over a seven year period, measured how much of a doctor's terminology was being clearly understood by the patient. The findings then led Master and his colleagues, including radiation oncologist Ashesh Jani, MD, and epidemiologist Michael Goodman, MD, MPH, to a second study made possible by a Winship multi-investigator seed grant that investigated video-based educational tools to improve patient comprehension. "It's one thing to identify a problem, but another thing to come up with a solution," says Master. "We saw a real need right in front of us and felt we had to respond." Presenters in the 2013 Research Forum were nominated by members of the AUA Research Council and a number of AUA specialty societies and the AUA sections. A panel of judges rated each presentation on innovation, potential impact on urology and the quality of the content and presentation. Master's presentation was noted for its potential to enhance patient participation in shared and informed decision-making. Master says this was a great opportunity to highlight the health literacy work that has been his passion since he joined Emory in 2005. "I'm honored for this recognition from the American Urological Association," says Master. "From the very beginning of my career, health disparities have been an important part of my clinical and research work." "It is a fitting tribute to the unique partnership between Emory and Grady Hospitals that Dr. Master's pioneering work in improving physician-patient communication has been recognized by the American Urological Association," says Martin Sanda, MD, Winship member and chair of Emory's Urology Department."Dr. Master is most deserving and we are grateful for his dedicated efforts at improving urology cancer care at Grady and Emory alike." Master is associate professor of urology, Emory University School of Medicine, and a member of the Winship Cancer Institute. His clinical interests are adrenal, testicular, penile, and especially kidney cancer. He has operated on more patients with advanced renal cancers invading the vena cava than any other contemporary surgeon worldwide. He was recently named to the editorial board of Cancer, a peer-reviewed journal published by the American Cancer Society. For more information on the AUA Office of Research, please contact: Leo Giambarresi, PhD, AUA Director of Research: 410-689-3712, lgiambarresi@auanet.org.